audience into a strange enchanting reality. 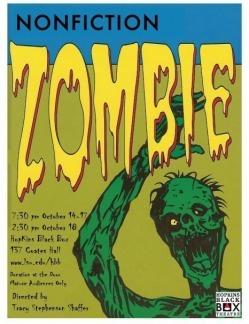 Directed by Dr. Tracy Stephenson Shaffer, assistant professor in the Department of Communication Studies, the multimedia performance incorporates popular texts and creative staging to show the rise of the zombie in popular culture over the last several years. "Zombies are everywhere," Shaffer said. "I created the show to explore what they are all about and why they’ve invaded the public’s imagination." Shaffer teaches a popular undergraduate course on the horror genre at LSU and noticed an increase in zombie films in the last few years. She also realized that scholars, in disciplines as diverse as philosophy, theology, literature, film, rhetoric, and even biological science, were embracing the zombie as a serious object of study. She wasn’t surprised. "A culture’s monsters reveal its obsessions, fears, fantasies, and anxieties," she said. "The monsters we love say a great deal about us." TO READ TRACY'S ARTICLE IN LIMINALITIES AND WATCH A SHORT VIDEO, CLICK ON THIS LINK. The photography below is by J.J. Alcantara. Bible Beater/ Bra Burner explores the Christian and feminist identities of 15 Eastern Iowa women and provide an interpretation of women's perspectives on faith, motherhood, relationships, politics, homosexuality, choice and freedom within and without the institution of the church. "'Bible Beater/Bra Burner' asks probing questions about what it means for a woman to claim or reject a Christian, feminist, or Christian-feminist identity through music, poetry and creative theatre techniques," said Freitag. TO READ JENN'S ARTICLE IN LIMINALITIES AND WATCH SHORT VIDEOS, CLICK ON THIS LINK.